Coin Show Saturday, May 18th, 10:00AM-6:00PM and Sunday May 19th, 9:00AM – 4:00PM, at the Wyndham Garden Hotel, 6401 Veterans Blvd., Metairie, LA 70003. 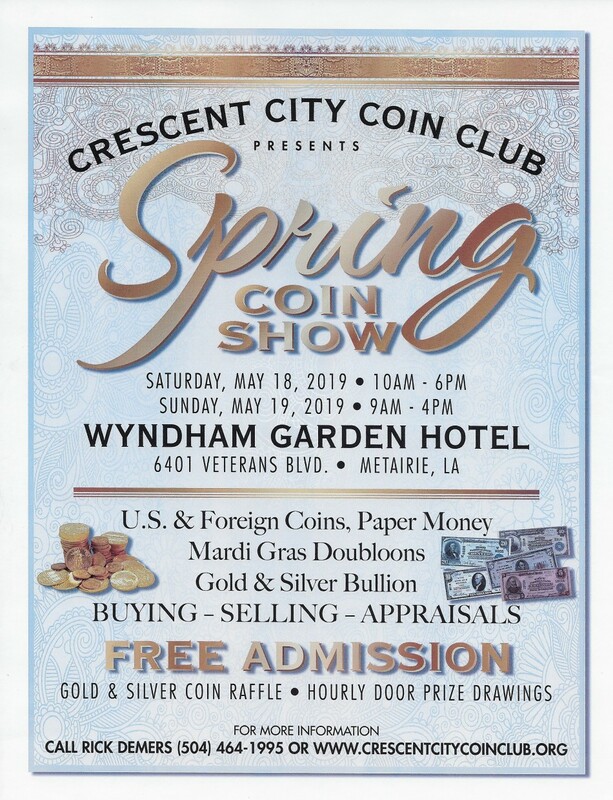 The Crescent City Coin Club, Spring Coin Show is free and open to the public to attend. The Show will feature buying, selling and appraisals of U.S. and Foreign Coins, Paper Money, Mardi Gras Doubloons, Gold and Silver Bullion. Hourly Door Prizes! More information at www.crescentcitycoinclub.org.